May 15, 2015 April 8, 2019 - The 'Noms. An Easter dessert, a carrot cheesecake perfect for Easter brunch or any spring celebration! With spring in the air, we wanted to make a dessert that would reflect the fresh start of the seasons. This carrot cheesecake was new to us, so in the spirit of something new, we decided to give it a try. 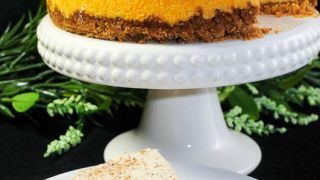 The carrot flavor in the cheesecake is subtlety sweet and makes for a beautiful color, but a wonderful carrot dessert. 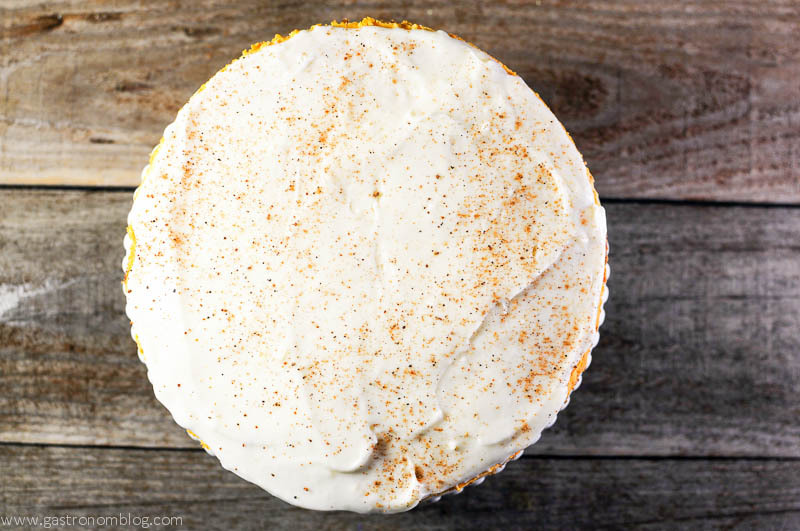 Combined with a graham cracker crust, a cream cheese frosting topping, and fresh grated nutmeg on top, it tastes like a creamy version of carrot cake! This would be a perfect dessert for a nice spring evening or for Easter brunch for an Easter dessert! 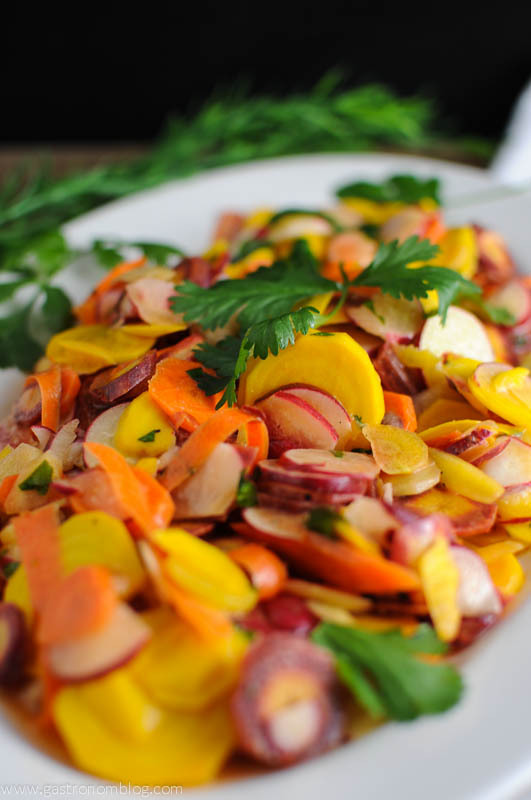 Pair it with our Carrot Ginger Mimosa! Make sure to find some fabulous Easter Dinnerware at Alchemy Home! 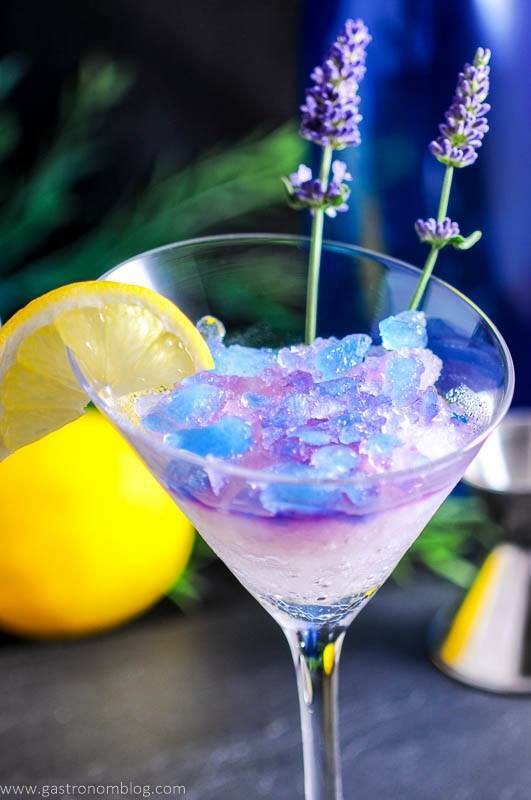 If you want a great dessert and cocktail all in one, that is perfect for Easter, try our Funny Bunny! 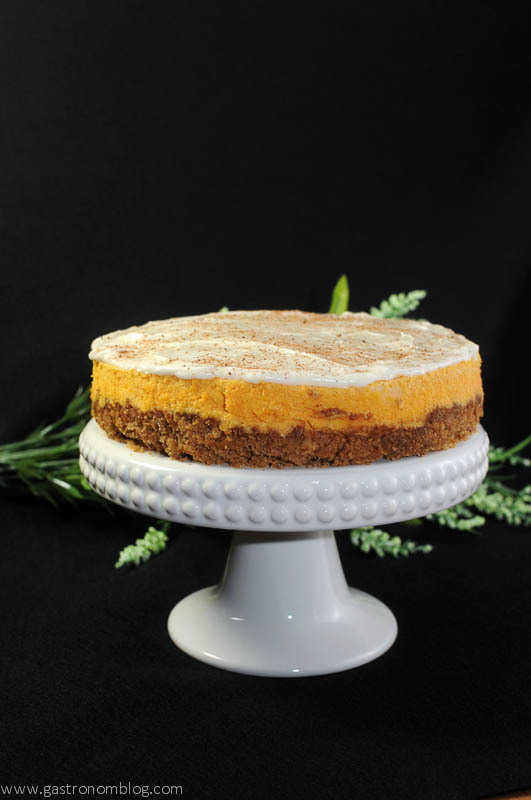 What Ingredients are Needed for the Carrot Cheesecake? A delightful dessert for Easter or spring. A perfect centerpiece for a brunch. Combine crumbs and sugar in a small bowl. 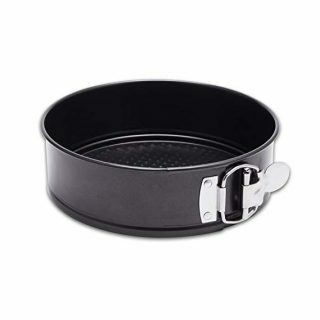 Press into the bottom of a 9-inch springform pan, continue pressing up the sides as well, about 1 inch. Beat cream cheese and sugars until smooth. Add eggs. Beat on low until just cmbined. Stir in cream, cornstarch, sour cream, vanilla, lemon juice and spices. Fold in carrots, pour into crust. Double fold aluminum foil around bottom of springform pan. Place into a large pan and add 1 inch hot water. Bake 65-70 minutes at 350° until the center is just set. Cool. Beat cream cheese and butter. Add powdered sugar a little at a time. Add vanilla and sour cream. Mix well. Top cooled cheesecake. Place in fridge until serving. Garnish cheesecake with grated nutmeg. 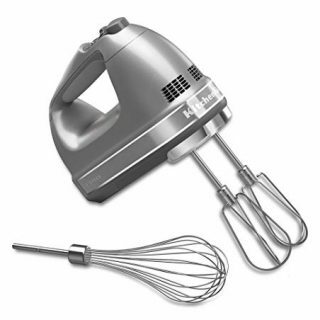 The frosting can be made 2-5 days in advance, the cheesecake it self up to 24 hours in advance. PIN THIS CARROT CHEESECAKE RECIPE FOR LATER! I have never been a big fan of cheesecake, but this looks amazing! I’ve never heard of a carrot cheesecake before! However, it sounds incredible!! .. And looks amazing too! Neither had we! It was a total experiment, but was delicious! It’s like carrot cake, but better! This looks perfect for spring. I love the color. The orange color it turned out was beautiful! I saw this picture on pinterest I think, and tried to avoid it because it’s going to ruin me. Seriously!! Carrot cake is just the best. Add cheesecake into the equation, and I am a lost cause. I need to make this, like today! Haha! It’s vegetables, right?! I LOVE carrot cake, and as cheesecake, I think it’s even better! I love the color! I am a big fan of cheesecake. I have yet to try carrot cake. Carrots just make it healthy, right?! Carrot cake and cheese cake are two of the best desserts ever. 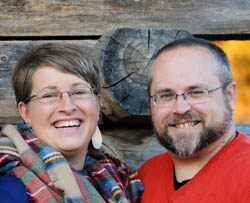 I have never heard of them combined before, but it is an inspired idea! It was a brand new idea to us, too! I thought it turned out well! This cake looks great and easy to make. This looks amazing! I want it right now! Oh my goodness ! 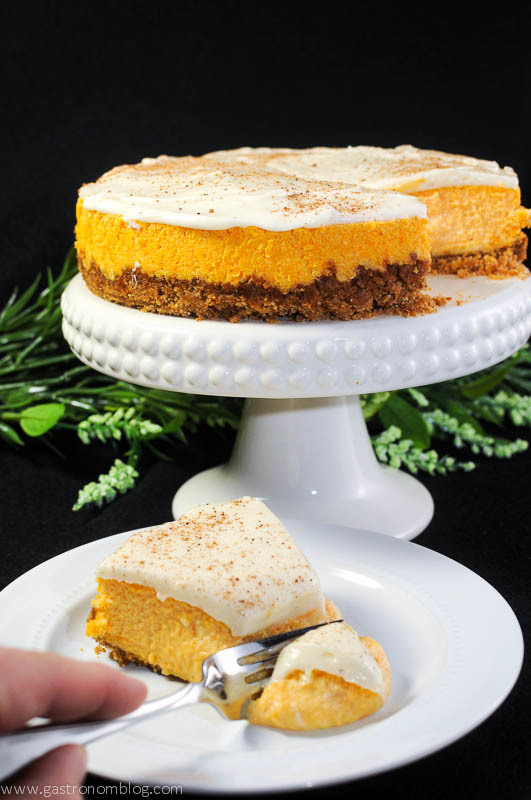 This carrot cheesecake looks gorgeous and delicious! Thanks for sharing! Pinned. Thanks! It is healthy, too, right?! This looks so good! I love carrot cake and cheesecake, so this is like a dream come true for me. Pinned! I love carrot cake too, this is the best of both worlds! Carrot cake and cheesecake? Shut the front door. You are going to be the death of my diet, but I’ll die happy! Another fabulous idea! Looks like a delicious delicious combination!! Nom nom nom! I love cheesecake and this looks amazing! Going on my list of things to make. Thanks! Let us know what you think if you make it! 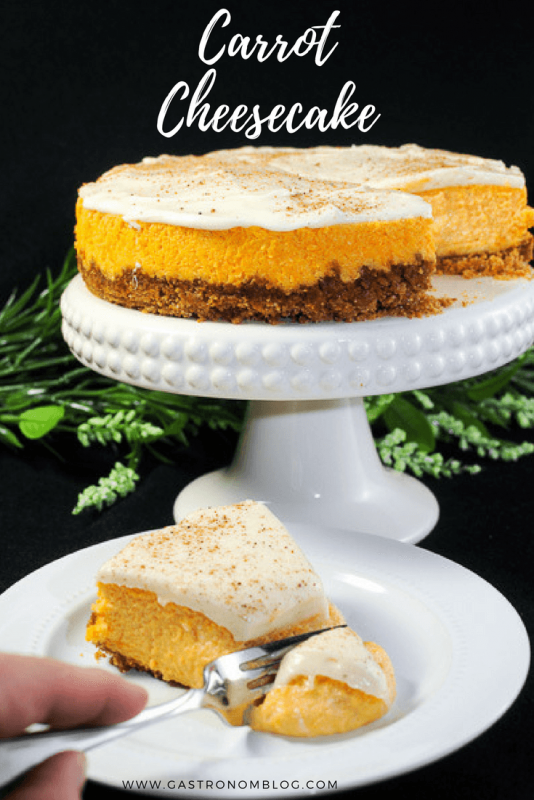 One of my absolute favorite desserts is carrot cake, so this cheesecake version sounds killer! Mine too! It was pretty tasty! Seriously, I just drooled on my computer. That looks divine! Its on our list of cheesecakes to make again! Hope you enjoy and thanks for reading! Looks delicious! I bet I could tweak that to make it vegan. Absolutely! Let us know how it turns out! Oooh, pretty! I had a friend bring cheesecake for Thanksgiving and it was a really nice and different addition. Bobi, I love making cheesecakes for any occasion – super easy and I don’t have to worry about pie crust! Pumpkin cheesecake in the fall/winter is my favorite! I like carrot cake and I LOVE cheesecake. I bet this tastes amazing!